The inquest into the death of Hull student Libby Squire has been opened and adjourned. 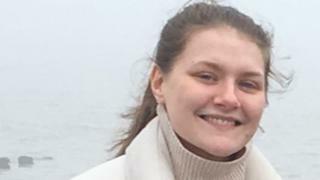 The 21-year-old's body was found in the Humber estuary on Wednesday, seven weeks after she went missing following a night out. Giving evidence at Hull Coroner's Court, Det Supt Martin Smalley confirmed the case was being treated as a "homicide investigation". Proceedings were adjourned pending further investigation. The court heard that due to continued forensic investigations Ms Squire's body cannot yet be released to her family. Det Supt Smalley said a man remained under investigation after being arrested on suspicion of abduction last month. More than 500 people took part in a vigil on Monday at the University of Hull campus where Ms Squire was studying philosophy. Her parents joined the crowd to observe a minute's silence. Ms Squire, from High Wycombe, Buckinghamshire, disappeared after a night out on 31 January. Police believe she got a taxi from the Welly Club to her home in Wellesley Avenue at about 23:30 GMT. She was spotted 10 minutes later on CCTV near a bench on Beverley Road, where it is thought a motorist stopped to offer her help. Her body was recovered at around 15:30 on Wednesday close to Spurn Point, near Grimsby Docks.